Since the roaring twenties and the days of Prohibition, the famed 21 Club in New York City has been the dining and imbibing destination of choice for countless movie stars, political figures, business tycoons, and industry leaders. Today it is more than just a restaurant, it is an institution. And though the building is home to many private dining rooms and special nooks and crannies, it is the charismatic Bar Room that has had people talking since the very beginning. Red leather booths snake around a room that features a giant wooden bar (complete with the original hidden chute used to quickly trash liquor bottles during the days of Prohibition). A bartender dressed in a dapper white coat and black bow tie makes the most delicious, ice cold martini we’ve ever tasted amidst a wall of gleaming spirits and stemware. Scattered around are tables draped in classic red and white checked cloths where countless celebrities have dined before. If you aren’t sold already, it takes simply one look skyward to further understand the room’s special charm and history. Dangling from every square inch of ceiling space is a blanket of toys and model trucks, airplanes, hard hats, telephones, records, tractors and other industry paraphenalia donated to the club by presidents, business executives, and industry tycoons. And this is where we get really excited. 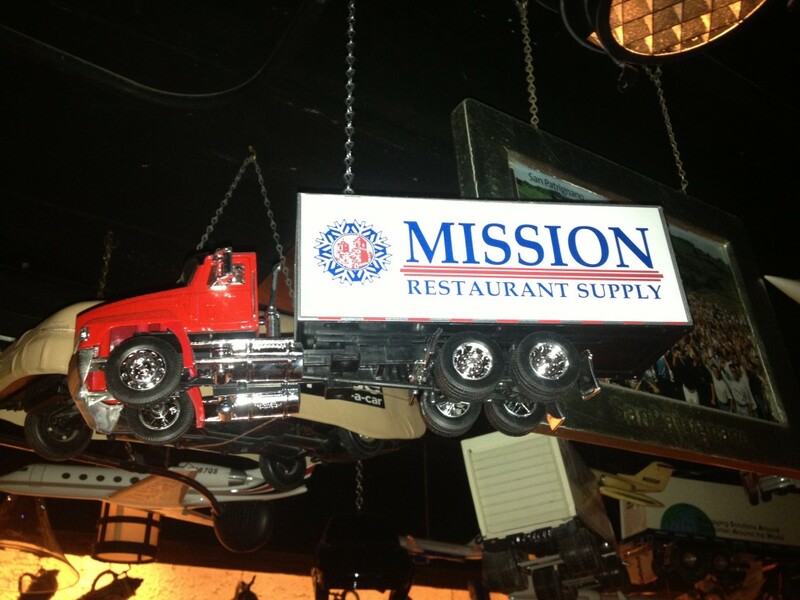 As of January 2013, we have had the honor of having our very own Mission Restaurant Supply truck hanging from the 21 Club ceiling over Table #14 in the legendary Bar Room. The room itself is a legacy to businesses around the world that have contributed positively to their markets, and an evening at 21 can be easily spent merely goggling at the amassed assortment of mementos from people’s professional success stories. So many notable figures have dined in 21’s hallowed walls that their website boasts an interactive map where you can find out which tables “belong” to which famous figures. Check it out here.